For thousands of years our ancestors have walked across hot coals or other sharp surfaces as a way to clear their mind and move towards something they desire. Fire walking has a very rich and beautiful history dating back thousands of years. Religions and cultures spread all over the world practice different forms of fire walking. The Vikings walked on hot chains. In Peru they walk across to red-hot stones that are heated in a large fire. In Hawaii the kahunas will walk across recently cooled lava beds. They are walking is a fantastic way to demonstrate how you can conquer your fear and move forward without being limited by your thoughts to reach your potential. 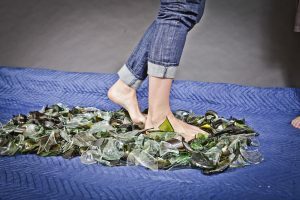 Glass walking can have the same benefits as fire walking but is a slightly different practice. By moving slowly across a bed of broken glass, you can learn ways to clear your mind and achieve levels of focus you never thought possible.